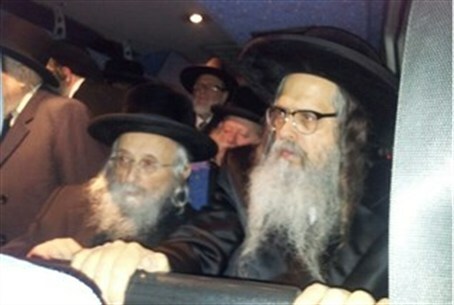 The Satmar Rebbe arrived in Israel on Sunday night and took part in an anti-voting rally in Jerusalem. The Williamsburg Satmar Rebbe, Grand Rabbi HaRav Zalman Leib Teitlebaum, arrived in Israel on Sunday night, on the occasion of his granddaughter's wedding which will take place on Wednesday. This is an historical visit by the current Rebbe, his first to Israel since he was appointed. There is another Satmar faction headed by his brother, Grand Rabbi Rav Aaron Teitelbaum in Kiryat Yoel, New York, that did not accept HaRav Zalman Leib's succession. Immediately after he landed at the Ben Gurion airport, the Rebbe went to Jerusalem and participated in an anti-voting protest rally at the hareidi Mea Shearim neighborhood, where he was greeted by tens of thousands of devotees. The anti-Zionist Satmar Hassidic sect is firmly in the camp that calls on its members not to vote in Israeli elections. Sunday’s rally was organized by the Eida Hareidit, a major representative group in the Ashkenazi hareidi world that is known for its strong anti-Zionist views. In the video, the speaker is urging the listeners to stand steadfast against those sinners who have left the Torah, quoting Psalm 119, verse 53: "Rage seizes me because of the wicked who reject Your instruction."